Today I drove by this gas station selling gas for $2.49 and $2.73. The price at the gas station which has the red sign which you've been seeing on my blog lately is selling gas for $2.49 and $2.69. 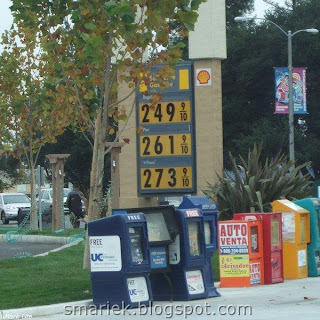 And Costco (the white sign in recent blog posts) is selling gas for $2.27 and $2.57. Yep. Prices have fallen a few more pennies. Perhaps it is time for a road trip! :-D Missy keeps telling me that she wants to go back to Monterey. She really enjoyed our last trip to Monterey & Carmel. It's great that gas prices make things more affordable now. I especially like the photo on your cable scarf link. I got quite a chuckle when I saw your little helper in it. I have seen it here in NE Ohio for 189.9 a gallon--just last night. Too bad my tank was full. I completely get staring at the computer screen and not feeling like you accomplished a thing. And with 2 little girls, computer time is getting more and more sparce! LOL Its all good though.